In Canada and in the United States, a football is a prolate spheroid ball used in the context of playing gridiron football. 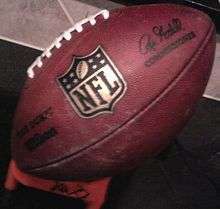 Footballs are often made of cow hide leather, as such a material is required in professional and collegiate football. 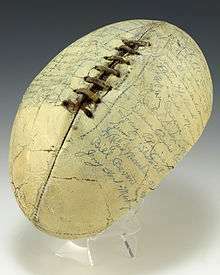 Footballs used in recreation, and in organised youth leagues, may be made of rubber or plastic materials (the high school football rulebooks still allow the inexpensive all-rubber footballs, though they are less common than leather). In the 1860s, manufactured inflatable balls were introduced through the innovations of shoemaker Richard Lindon. These were much more regular in shape than the handmade balls of earlier times, making kicking and carrying easier. These early footballs were plum-shaped. A white football signed by the members of the 1935 Collegiate All-Star Team, including Gerald Ford. Early American footballs were essentially rugby balls, later redesigned to make them easier to throw. 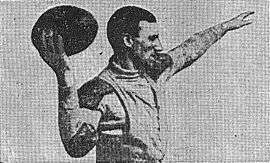 In this 1905 photo, Bradbury Robinson, who threw the first legal forward pass, demonstrates an "Overhand spiral—fingers on lacing"
The old melon-shaped ball measures from 28 to 22 inches in circumference, while the modern ball measures approximately 21 inches. In the CFL the stripes traverse the entire circumference of the ball. The UFL used a ball with lime-green stripes. The XFL used a novel color pattern, a black ball with red curved lines in lieu of stripes, for its footballs; this design was redone in a tan and navy color scheme for the Arena Football League in 2003. Two indoor American football leagues, the Ultimate Indoor Football League and American Indoor Football, used a ball with red, white and blue panels. The USFL (1983-85) used the same Wilson football the NFL used at the time, with the only differences being the word markings and signature. In an NFL game, the home club must have 36 balls for an outdoor game or 24 for an indoor game, and they must be available for the referee to test with a pressure gauge two and a half hours before the game. Twelve new footballs, sealed in a special box and shipped by the manufacturer, are opened in the officials’ locker room two hours before the game. These balls are specially marked with the letter "K" and are used exclusively for the kicking game. The visiting team may also present 12 balls to the referee for outdoor games for inspection. Since 1941, Horween Leather Company has been the exclusive supplier of leather for National Football League footballs. The arrangement was established by Arnold Horween, who had played and coached in the NFL. Horween Leather Company also supplies leather to Spalding, supplier of balls to the Arena Football League. ↑ Trueman, Nigel. "Rugby Football History". Retrieved 27 July 2016. ↑ Wiley Lee Umphlett (1992). Creating the Big Game: John W. Heisman and the Invention of American Football. pp. 141–142, 144, 148, 151–152. ↑ Pearson, The People History -- Steve. "History of The Game Of Football Including The NFL and College Football". Retrieved 27 July 2016. ↑ Pees, Samuel T. "John Heisman, Football Coach". Oil History. Retrieved 2014-11-12. ↑ "Rule 2: The Ball" (PDF). National Football League. Retrieved 29 January 2015. ↑ "Rulebook". Nfl.com. Retrieved 30 May 2011.